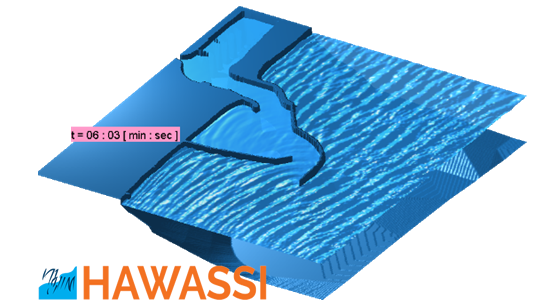 The HAWASSI-VBM is a software for the simulation of realistic waves in wave tanks and oceanic and coastal areas, harbours. VBM for simulations in the deep ocean and for coastal areas with strongly varying bathymetry and complicated harbour lay-outs with partially reflecting walls and breakwaters. A user friendly GUI and an extensive manual guides the modelling set-up; starting with the coast line boundaries, successively influx lines, harbour walls and damping zones can be added, after which a depth-dependent unstructured grid is generated. Embedded wave influx of short crested waves for given parameter values or user defined time signals. For long simulations there is the option of partitioning the calculation. Post-processing is guided by a GUI. With an internal flow post-processing module, the interior fluid velocities, pressure and acceleration can be calculated to determine forces on structures.